Certain areas - including flowering borders in their back yard - have undergone more transformations than Joan might care to admit. Recent projects have included installing a deer fence around their vegetable garden, laying flagstone and gravel paths, planting a test bed of various varieties of lavender, and transplanting 20+ roses from throughout the landscape into a dedicated rose garden in an effort to protect the delectable foliage and flowers from deer. 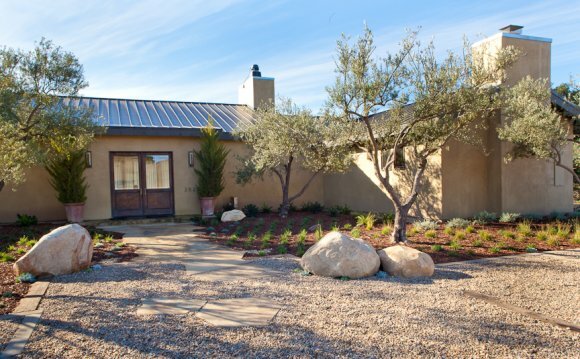 While most of her landscape design projects are on the South Coast - in Santa Barbara, Montecito, Goleta and Carpinteria - she has also created gardens in Santa Ynez, Los Olivos, Buellton and Los Alamos. Many of her projects are renovations - her clients have inherited or grown tired of existing, overgrown landscapes and want to start fresh. So out go the Bermuda grass, bedraggled shrubs and other lackluster vegetation, and in come fresh, colorful plantings custom-designed for each client's special wishes and needs.